Tabac Original by Mäurer & Wirtz (1959) was ignored by me for many years after I took one whiff of it in my early days, and dismissed it. I can't even remember what was it that turned me off it - but I vaguely recalled feeling it was too overbearing and just let it remain on the shelf at London Drugs while I explored and rather enjoyed other cheap thrills there. Years have gone by, and on a long-in-the-making hunt for men's drugstore fragrances, spearheaded by the absence of Old Spice, I decided to get a bottle of this one before it might disappear. Except for that vague recollection of the scent from many years past, you could consider it a blind buy. There was no justification for this purchase except that it had the word "Tabac" in it, and I just invested over a week of my life researching and teaching the topic of tobacco fragrances to my students. I figured - if I own English Leather, I might as well get this one too. So last week, when the above mentioned acquisition took place, I arrived home carrying as many as four masculine drugstore classics, including an 800 mL of 4711 Echt Kölnisch Wasser, and being $90 poorer (for all four scents combined - the latter was the most costly of the bunch, at $54; Tabac Original was another high-end purchase at $24.99; the others were Old Spice and Brut, each at just over or just below $10). But I will tell you more about those later this week, as I go through the very limited and neglected bunch of masculine scents in my fragrance collection. 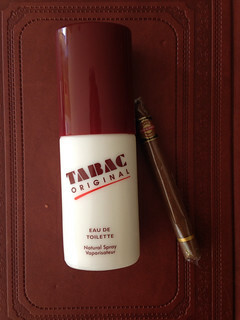 Because the other scents were already familiar to me (and some, like Brut, I could even just open and smell without any trouble returning them if I change my mind) - I decided to take my chances and that very same afternoon, sprayed myself (first hesitantly, and then rather lavishly) with Tabac Original. In essence, I was simply wowed by its originality, that I was able to quickly forgive the complete absence of any representation of "Tabac". There is no tobacco to be sniffed out in this fragrance, not even after a week of wearing it pretty much daily. The opening notes are a delicious concoction of spices that exhale confidence, polished masculinity, and are pleasant and remind yet also bold and unusual. The spices all have a woodsy-dry character, which are most befitting for a masculine fragrance: Allspice, black pepper and nutmeg are at the fore, chased after by dry ginger, and this trio comes across as warm-dry yet invigorating (no pastry association, surprisingly). There is also some lavender, hints of pine, petitgrain and other citrus notes which gives Tabac Original its freshly showered skin, soapy accent, which provides a beautiful contrast and balance to the spices. The lavender also adds an herbaceous, masculine floral nuance. The floral aspects are subtle, but can be also felt in the heart, where you might notice the clove-like presence of carnation, more soapy neroli, hints of geranium. But mostly what's present at the heart is an overdose of vetiver - or more likely, vetiverol - the vetiver alcohol that gives it the fresh and clean, tart-yet-sweet personality that is prevalent in Haitian vetivers more than any other variety. It's woody yet also gives off an almost juicy-citrusy feel, but also is very dry and elegant. This beautiful note is slightly balanced by hints of geranium, which also contributes to its masculine, dry-fresh and never overtly sweet character (even though if you'll notice - there is a lot going on here that could have made this sweet, if the perfumer only wanted it to go that direction). There is also a fair amount of alpha isomethyl ionone - which although does not occur in nature - it echoes the naturally occurring ionones in tobacco (though I am not sure I ever actually smell tobacco in there), and gives it some dry-violet, woody-floral nuances. As we progress towards that base notes, the woodsy notes take over. And there isn't just vetiver - there is also cedar, and minute amounts of coumarin, which hint at the underlying flavour of a fine cured tobacco leaf, there is salty element too that is only vaguely reminiscent of oakmoss (there is non on the packaging, so perhaps they are now using evernyl, which is a very light and dry-smelling synthetic which vaguely resembles atranol-free oakmoss with non of its ambers-musky-mossy richness). But what really dominates the composition at the dry down is musk. And plenty of it. What we'd call "white musk", or the same musk combination you'd smell in musk oils that are sold in various shops offering fragrance oils (and often mistaking them for essential oils). Tabac Original thankfully develops this scent only many hours in, and until then it's mostly vetiver and spice and lavender goodness. It is one of the rare occasions when I care about the top and middle notes far more than the base notes - which I feel cheapen the otherwise superb composition. 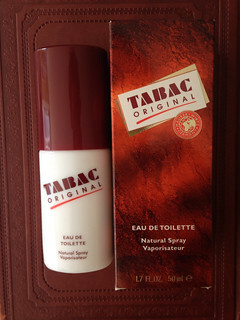 "TABAC ORIGINAL Eau de Toilette is a modern fragrance with intensive lasting strength. Masculine, expressive, individual. A fragrance that underlines your personality" (quote taken from the back of the box for this fragrance). Tabac Original also comes in a variety of shaving and grooming products such as a shaving soap and an after shave (on which I can not comment meaningfully, because try as I may, my beard never develops to more than a stubble, and the moustache I sport is limited to Movember's paper touché). But a glimpse into one of those vlogs makes shaving look like a rather sensual ritual that I will look forward to in my next incarnation, in which I hope to spend my entire days lathering soap and playing with the foam for hours on end. Try the edc. It is preferred by almost everyone and it represents the original scent. The EDT is actually quite different.